Good evening, Rouges! This is my first actual post on the forum (aside the quick welcome). I present to you, kings of the 1980’s Run DMC! Left to right Jason “Jam Master Jay” Mizell. Joseph “DJ Run” Simmons, Darryl “D.M.C.” McDaniels. Usually I do not enter competitions however, Gino (YgrekLego) sent me a text revealing to me the theme – I just had to build something this time – being myself a product of this particular decade. I actually started out building a simple model of the red “Speak and Spell” learning computer made famous by the movie, E.T. But, Then Marcel V. posted the entry “Because the cat doesn’t fit in the toaster.” Alf in all his glory behind the counter, complete with kitchen backdrop. It was at this stage that I decided to up my game and build some heroes of mine, with a backdrop. If you have been living under a rock since 1981 Here is a taste of what you have been missing. Loosely based on what they are wearing in the image below. I built Run's tracksuit jacket in the typical Australian 'Green and Gold' Olympic style. Dedicated to Jam Master Jay, rest in peace. I Like the Three Stripes Look, the Chains on they'r Necks. Hey Arran, sehr coole Beitrag...vor allem cool dass wir beide den gleichen Jungs ausgewählt haben (ja, ich hab meins noch gerade rechtzeitig geschafft ). 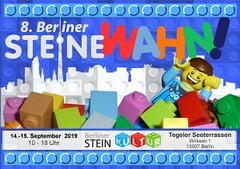 Die Figuren sind super geworden ...aber der Skyline mit Logo sind für mich das Highlight! Very creative execution of an idea. That can be the hardest part, especially when you create a character, how do you present them? That backdrop makes it work. It doesn't get more 80's than those guys. They basically defined a good part of american culture, including fashion. Good show sir. Toller Beitrag der sehr gut einen Teil der Achtziger präsentiert, da gings richtig los mit dem Hip Hop. Legendärer, zeitloser Schriftzug. Hab jetzt auf Flickr gesehen ! Witzig das wir die gleichen Gruppe gebaut haben. Richtig geil. Wie geil sind die denn, sehr cool Arran. Die sehen hammer aus, musste mal zum Stammtisch mitbringen. Klasse, dass du der Musik auch bei den Contests treu bleibst. Hm, Run DMC sagt mir gar nix. Wo war ich nur in den 80ern? Egal! Dein MOC ist der Hammer. Die Figuren sind dir super gelungen. So wie man es von dir gewohnt ist. Schön, daß Gino dich auf den Bauwettbewerb aufmerksam gemacht hat. was für ein cooles ungewöhnliches Moc! Die Figuren sind aber wirklich der Hammer! Arran - ganz großes Kino! Die Figuren sind dir als Figuren aber auch als Darstellung im ganzen Moc sehr gut gelungen.Und mit der Skyline und dem Schriftzug macht es dein Moc rund. . Klasse gemacht! Das würde den Amerikanern in unserer Ausstellung in Kaiserslautern gefallen. "It's Like That" is the debut single by American hip hop group Run-DMC. Really cool Entry from you, it‘s just „like that“ and so I wish you all of success! @matze2903 yes indeed, I’m still shocked at how much faster the Jason nevens remix is !